Remember when? This pic showed up in my Facebook feed this morning and it sent waves of terrifying flashbacks through me. Incidentally, my mother was a school librarian, so you can imagine. My heart started to race, my eyes opened wide...well maybe that was the coffee. Either way, this is the form of "Googling" that I grew up with. 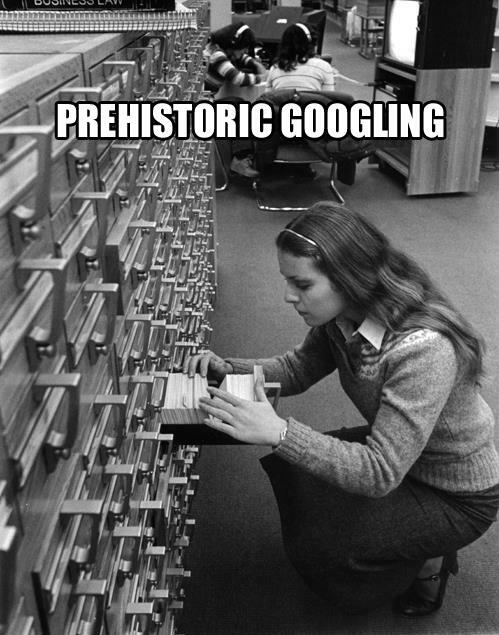 In fact, I immediately Googled card catalog images... and wished that I hadn't...back to the photo. The reference card the girl in the picture picks up will most likely lead her to a book or research article with outdated information based on research carried out in a similar fashion. There will be no rapid connections made pointing her in new directions without opening a new drawer and sifting through a stream of unrelated or outdated resource references. When I think about how I access information today, it doesn't even compare. Imagine if the girl in the photo found out that within a couple of minutes, she could sift through endless volumes of current, relevant information, and contact experts across the globe to learn the information that she seeks without ever leaving her computer or picking up her land line phone. At best it would be the makings of a great sci-fi tale, a Farenheit 451 or 1984 if you will. Though this futuristic account of card catalogs would be frightening indeed, imagine if the situation were reversed and the sci-fi novel told a decidedly harrier tale, the disappearance of the Internet as we know it and a return to card catalogs and geographical isolation. This made me think about how we structure learning for our students. In my last post about problem finders, I talked about Ewan McIntosh's design thinking school, NoTosh. In his blog post about problem finders, Ewan states, " Teachers, for too long, have actually been doing the richest work of learning for their students. Teachers find problems, frame them and the resources young people can use to solve them. Young people get a sliver of learning from coming up with ideas, based on some basic principles upon which the teacher has briefed them, and the teacher then comes back on the scene to run the whole feedback procedure." Now I am going to make the assumption that all of you reading this blog exist on the tech savvy side of the learning continuum. You are after all reading blogs on the Internet, and some of you were directed here from some form of social media or RSS feed. As a teacher, do you define your own problems or does someone else find them for you? Does someone else supply you with your resources for learning or do you discover them on your own? When asked why we do so much of the legwork for our students in terms of finding and framing problems and identifying resources, we usually respond that we don't have enough time, or they aren't good at it. If that is the case, then isn't that the one skill that we SHOULD be teaching our students ? As teachers, we need to reprogram our card catalog habits. I propose that we write our own sci-fi novel; one where students are empowered to discover, research, and solve problems through prototyping using their special powers of information fluency and critical thinking. SPOILER ALERT: In the end, these superheroes reverse global warming, cure cancer along with a host of terrifying diseases, bring peace to the Middle East, and force Justin Bieber and boy bands into obsolescence. Well at least that is what would happen if I was the author. On that note, it is spring break and I am going to give this disappearing Internet fantasy a go!